So what are the components that make up a solid roof for one’s wealth? I believe they can be broken down into three areas, as follows. The category of insurance is broad ranging, with each sub-set containing its own characteristics. But as a whole, insurance is a financial instrument that can provide protection against a specified loss or hardship in return for a premium payment. Here are the primary areas of insurance protection that need to be addressed (listed alphabetically). There is really no way around having this one, as only 2 states don’t require a policy be in place before a driver is legally allowed to get behind the wheel. A suitable auto policy should have 1) LIABILITY which covers situations in which you are responsible, 2) UNINSURED/UNDERINSURED which covers situations when someone without adequate insurance is responsible, 3) COLLISION which covers damage to your vehicle, 4) MEDICAL which covers injuries as a result of an accident, and 5) COMPREHENSIVE which pretty much covers all other forms of damage. Maybe one of the more neglected forms of insurance, disability insurance is important because it provides protections against one of the more significant threats to households: loss of income due to injury. Disability insurance comes in different forms (short-term, long-term, lump-sum), so understand the options and find a coverage that will best fit your situation. Most workplaces offer group disability insurance at a very affordable rate. This might be the biggest one of the bunch, as it’s estimated that over 62% of all bankruptcies in the U.S. are due to medical bills. This is why having proper health insurance coverage is mandatory. When scouring the market, try to find the policy that strikes the right balance of cost versus protection for your situation. People who are prone to health issues will likely require a more comprehensive plan. Whichever option you choose, just make sure the deductible does not surpass the amount of cash savings you have on hand. Whether renting, owning as a primary dweller or owning as an investor, insurance on a residence is essential. RENTERS insurance provides protection against damage or theft of your possessions, and can provide liability protection if you’re found responsible for something that happens on the property. HOMEOWNERS insurance is more comprehensive in nature (and thus more expensive), covering the entire value and risks of the property. If owning a property as a LANDLORD that houses a tenant, increased liability and loss of rents protections are recommended to protect against a lawsuit or loss of income. If owning a property that is located in a region with a natural disaster risk beyond normal hazards, coverage should be added to protect against those very real concerns. It’s up to you (not the insurer) to know the risks of your specific situation. Most defensive insurance policies (auto, home, etc.) include some form of liability protection. However, the extent of that coverage is usually capped and this is where additional personal liability protection can come into play. A personal liability umbrella policy provides a shield of protection above and beyond your existing policies limits. If serious about protecting your hard-earned assets, this policy should be in your financial protections toolkit. Life insurance is required to provide financial protection for those you love should something happen to you. An effective policy needs to be able to cover your outstanding debts and provide for the living expenses of those that depend on your income. So if debts or dependents are indeed the picture, it’s essential to make sure you’re sufficiently protected with the right kind of policy. Don’t skimp on this. Proper life insurance protection can normally be obtained for a surprisingly affordable price. Much like insurance, the world of estate planning is fairly broad-ranging. Most people think having a will in place will sufficiently protect their family and their hard-earned assets. Not quite. Here are all the areas of estate protection that need to be addressed to make sure you don’t leave behind an estate that is disarray and/or diminished in value for those you care about (again, listed alphabetically). A basic will is the foundational item in a properly executed estate plan. It will spell out important items such as who gets your belongings when you pass, guardianship of your children, if a trust is to be formed for any specific purpose, and who will administer your estate. Make sure that those who will have a role in your estate know what their responsibilities and have a copy of your executed will in hand. Know that beneficiary designations listed on life insurance policies, retirement accounts/plans, and pensions and/or annuities will take precedent over anything listed in a will. Make sure these are current so that those you wish to receive a financial benefit (and not an ex!) indeed do. Tracking down accounts and important contacts (accountants, attorneys, etc.) is often the most time consuming and tedious task for an executor handling an estate. That being said, having an inventory as part of the will to help guide in this process might be the most generous parting gift a person can give to another. A living will is a medical directive that outlines your end of life wishes (if a recovery isn’t in the cards) so that others don’t have to make that difficult decision on your behalf. Remember, proper estate planning is just as much about making life easier for those you leave behind as it is about preserving your assets. 2 types of powers of attorney need to be in place should you be incapable of making important life decisions at any given time. The first is a DURABLE POWER OF ATTORNEY which gives the person of your choosing the power to make financial and legal decisions on your behalf. The second is a HEALTH CARE POWER OF ATTORNEY which allows the persona of your choosing to make health care decisions on your behalf. Also of importance and in the realm of estate planning is how assets are held and titled. If a particular asset has significant risk of litigation, owning in a separate entity (such as an LLC) can make sense. This could shield the remainder of your net worth if a lawsuit on that particular asset were to rear its head. Also, know that titling of an asset usually designates control. For example, if you don’t trust a child to have full access to your savings account, don’t add their name as joint owner. Once added, they have just as much right to the entire balance as you, regardless of what your will might say. 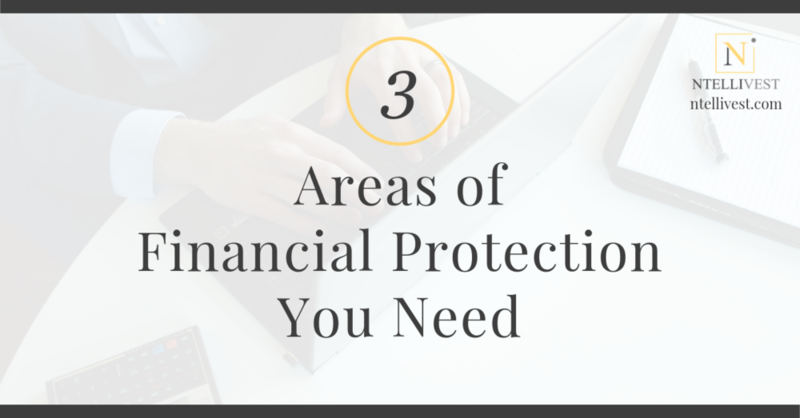 In terms of financial protections, savings is simply referencing an emergency fund or easy access to cash to cover an unforeseen event or expense. This is more simplistic in nature than the prior 2 points above, but is just as important to helping keep your goals on track and finances out of the red should a bad situation arise. It’s easy to spiral down if not prepared, and that slippery slope is often where people find themselves having conversations about filing for bankruptcy. Most financial gurus recommend having 3-6 months of household living expenses on hand in form of cash/savings accounts. The thinking is that this should be enough to allow you to get back on your feet should a job loss or financial emergency arise. But if struggling to save, simply shoot for putting aside $1k. This will be able to cover the majority of unexpected expenses, making one less likely to pull out the credit card without dedicated funds to pay it off, and avoiding the origins of a debt snowball. Or consider this money hack. A Roth IRA could act as a hybrid account that is both an emergency fund and retirement vehicle. Unlike a traditional IRA for work retirement plan, all contributions (not earnings) made to a Roth can be withdrawn at any point in time without taxes or penalties. So if an emergency were to rear it’s head, contributions could be withdrawn to get past the hardship then restarted once the difficulty has passed. Successful planning should never dismiss creativity. Is your financial house in good order? Like a normal home, if it’s been a while since showing some love to your roof, now is likely the time to go out and make some repairs.